Please contact Planet Hollywood London directly to redeem your ticket using your iVenture Card. To make bookings over the phone, please call 020 7287 1000. The booking line is open between 9:30 am and 11 pm every day. A menu to choose from will be provided upon arrival with all extras being settled directly with the operator. No drink included. 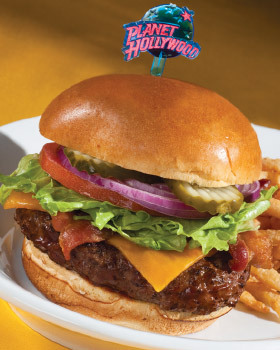 If you’re a hungry movie buff, then there are few places better to satisfy your cravings than Planet Hollywood. The London branch is perhaps one of the most famous and successful Planet Hollywood outlets in the world. It is the ideal spot to take go for a delicious Set Lunch Menu before hitting one of the local venues for a play or a movie. The irresistible set three-course menu includes a soup of the day and ciabatta. It also features a variety of options including the Classic Planet Hollywood Burger, Classic Planet Hollywood Cheeseburger and Veggie Burger. End your satisfying meal with a delectable ice cream cheesecake. While you wait for your order to arrive, you’ll have ample opportunity to check out the movie clips on one of the 16 screens throughout the restaurant or have a peek at some of the superb movie memorabilia on display such as the leather jacket worn by John Travolta in Grease. Don’t forget to check out the gift shop for a full range of Planet Hollywood merchandise, including that famous t-shirt. Based in Haymarket in trendy Piccadilly, Planet Hollywood London is just two minutes from iconic Piccadilly Circus, a pleasant stroll from Charing Cross or Leicester Square - if you’d like to take in the sights of this popular part of London along the way. Planet Hollywood is also served by numerous public transport links. The nearest tube station is Piccadilly Circus (Piccadilly and Bakerloo Line).